Who is each of the membership types for? Our Basic membership is for people who want to be part of the Stitch Community but aren't ready to commit to a Full membership yet. This membership allows Basic members to come along to selected events to find out about the Community and meet other Stitch members. It’s a great way for new members to dip their toe in the water of Stitch and find out what it's all about before deciding whether they want a full Community membership. Basic members are only allowed to attend events that are labelled “Open to all members”. These usually constitute around 10% of all activities in any local community. They are not able to participate in the Stitch Chat forums, or access any of the other many "Full members only" features of Stitch. These features are outlined at the bottom of this page. So why does Stitch offer a free membership? In case you don’t already know, Stitch is a social enterprise. Social enterprises are businesses whose primary goal is to address an important social issue and make a positive impact on the world. Research has confirmed time and again that positive social connections help us lead healthier, happier and less stressful lives, but far too many people lose social connections as they age. Our aim is to help local communities connect and help people make meaningful friendships that enrich their lives. Having said this, not everyone is able or ready to support the community with even a small annual membership fee. Some people face truly significant financial constraints, while others are in the process of major life transitions and aren’t quite ready to join a community like Stitch. So that’s why Stitch offers a free membership. We ask that most Basic members eventually choose to become Full members of the community once they’re ready, but if they face financial constraints that make that impossible, they can still participate in the community to a limited extent as a Basic member of Stitch. It should be clear by now that Stitch is a membership-based community. That means the only way we are able to continue to operate, support, and grow the Stitch community is through membership fees (and even that would not be possible without some additional government assistance which supports Stitch’s social mission). We chose a membership-fee community model as we believe it’s the only one which allows a community to operate solely in its members’ interests. Other ways of generating revenue, such as through advertising, puts a company in the position where it is ultimately beholden to those advertisers, rather than the people they really should care about. We’ve all seen how that ultimately plays out with every single “free” social network over the past few years. We have intentionally chosen a very low annual membership fee for our Community membership, to make it as affordable to as many people as possible. For a very simple comparison, our Community plan is just a fraction of the cost of a membership of anything you’ll find on an online dating site. All our modest membership fees are reinvested back into the community, with every dollar going towards not just operating, supporting, and improving the Stitch site and app, but also promoting Stitch in new and existing areas to grow and enrich our community with more members. And with more members comes more opportunities for companionship, which benefits everyone in the community. Everyone who chooses a Full membership is doing their bit to support the community! The Community plan is suitable for most members. It entitles you to be a full member of the Stitch community, with unlimited access to community activities, interest groups, online discussions, and membership rewards. As the name implies, the Community Plus plan includes all the benefits of the standard Community membership, with extra features tailored to suit members who are seeking romance or other forms of one-on-one companionship. These include the ability to browse member profiles on the Members page, greater access to one-on-one connections, and the ability to view additional profile information about other members. If your main goal is to get fully engaged with the Stitch community in the real world, connecting with new companions at the same time as enriching your life though activities you enjoy with like-minded people, then choose the Community plan. If, on the other hand, you want to use Stitch as an online tool to browse member profiles and connect with other members one-on-one, or are specifically looking for romance, then choose the Community Plus plan. Both plans provide full membership of the community, as we ultimately believe that the best way to enrich your life is to engage with other members in the real world, rather than sitting at home looking at profiles and sending messages, and we encourage all our Plus members to participate in the community as much as they can. We recognize, however, that some members want the ability to do both. It’s worth noting that members on the Community plan who contribute consistently to the community by creating events and activities, or getting new members to join, will be rewarded with higher Membership Status, which in turn can provide them all the benefits of the Community Plus plan. The following lists outline the various feature differences between Stitch’s different membership types. A Community membership is valid for one year. A Community Plus membership can be chosen for an annual, 6-monthly, 3-monthly or monthly renewal period. Below are some of the most frequently asked questions about Stitch membership pricing and how Stitch works. If you don't see an answer to your questions here, check out the rest of our help articles on the Stitch Help Center, or else feel free to send us a message! What is the cost of membership for each membership type? Our annual and monthly membership fees vary in different countries based on different exchange rates and currencies. In the US and most other countries, a Community membership is $60 per year, while a Community+ membership starts at $15 per month when billed annually. Stitch currently supports pricing in local currencies for Australian and UK members, and we hope to add more countries later this year. Go to the Stitch Membership page to see the membership fees that apply in your area. Why are the annual plans so much cheaper than the monthly plan? One thing we've learned at Stitch is that the best relationships don't happen by reading and dismissing thousands of profiles online. They happen by being engaged in the community, getting to know other members based on shared interests, and judging them by how they behave more than what they say about themselves on their profiles. We've also learned that finding the best relationships takes time. So that's why we try to make our annual plans as attractive as possible, to encourage members to join the community for the full year, and maximize their chances of getting the most they can out of being part of Stitch. Can I try Stitch for free before joining? The Basic membership was designed to let you do more than just try Stitch for free ... you can stay a Basic member as long as you want! You will be invited to any Open events and activities in your local area, which will let you come along to meet other Stitch members and find out what Stitch is all about. 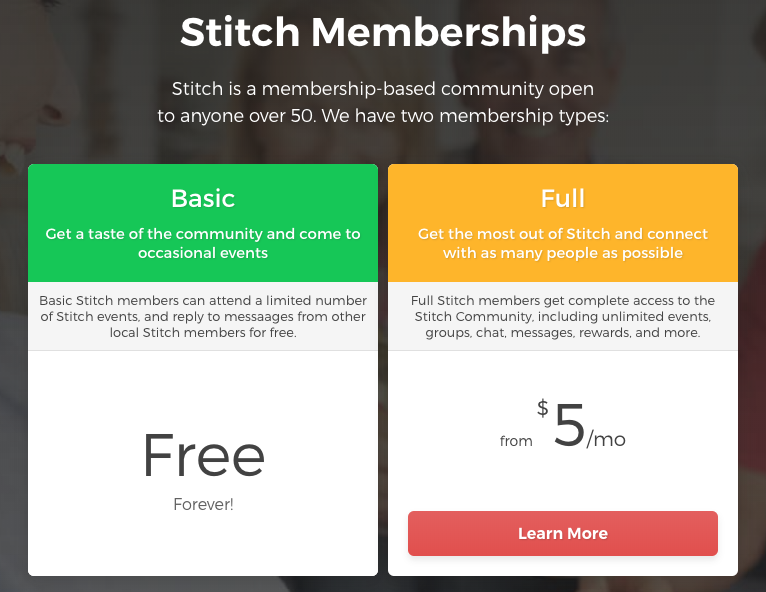 If the Stitch Community isn't fully active in your area yet, you don't need to worry, you can stay a Basic member as long as you want for free. And you'll be the first to know when other members in your area start organizing groups, events and activities! Stitch isn't in every city just yet, but we don't expect our members to take out paid memberships until they feel that Stitch is for them. A Basic membership lets you do exactly that, for as long as you want. Of course, we hope that once you've had a taste for the Stitch community you'll eventually choose a paid membership so you can support what Stitch is doing, but that's completely up to you. Absolutely! If you don't want your membership to renew in the next billing period, just select Manage Subscription on the Membership page and cancel your renewal. Can I switch between membership types? Absolutely. If you've already selected one membership type and want to change to a different one, simply press the View more membership plans button on the Memberships page and select the new plan you'd like. Stitch doesn't charge anything beyond the membership fees noted on our web site. Please note, however, that our current credit card processing provider is a US-based company. This means that if you live outside the US, it is possible your bank will impose an international transaction fee when your membership is processed, even if we are charging in your local currency. Not all banks do this, and we don't think the charge is justified, but there isn't currently anything we can do to prevent them from charging you this extra fee. We will be working to implement a new payment gateway to remove these additional charges in the future.